First year of law school down... what next? For most of us, we move onto our first legal internships to fill the summer between 1L and 2L year. Personally. I will be working in my local criminal prosecutor's office and receiving class credit for externship experience. Preparing for my first foray into the professional legal world has me a little stressed out and apprehensive. Regardless, I have spent my week off between the end of finals and the start of my internship preparing myself in every way I can. One thing I have had tucked in the back of my mind for years is my future as a lawyer = professional wardrobe every. dang. day. Partially fun to dress up every day, partially daunting to dress like that day in day out and never being able to rock a pair of leggings at work. Over the years, I have been collecting professional clothing when I find it on sale or something I just have to have (working at TJ Maxx all through college helped with that). As my first legal internship has been growing closer, I have been spending a little time and moolah on my "lawyer wardrobe". J. Crew Factory has some amazing sales! I have gotten some amazing deals including a $12 lace pencil skirt! The sales rack at Kohls has also been rather good to me. I tend to be a constant shopper.... no matter where I am, I browse and see what I can happen across; if it is a good deal, I get it. This has led to me taking over the closet in our office with just my professional clothing... sorry hubby! 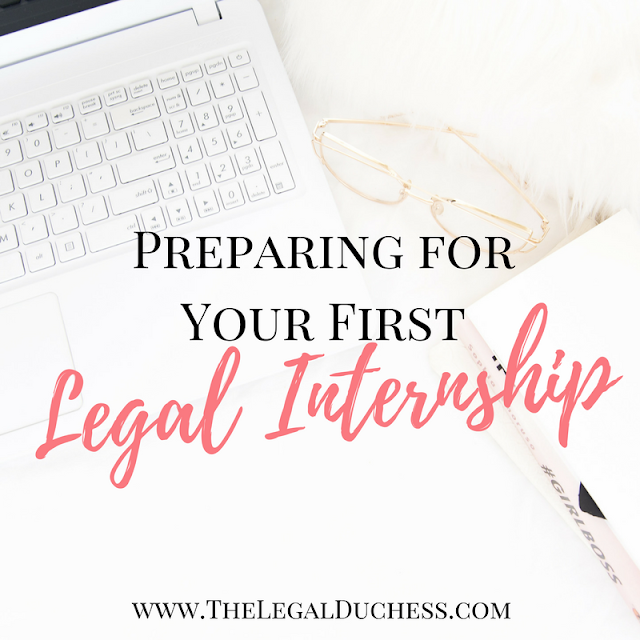 I highly suggest spending some time and money before you start a legal internship on amassing a wardrobe large enough and varied enough to last you a whole summer in a law office. You don't want to be known as the girl who wears the same pants every other day or spend the first few weekends shopping frantically and getting stuck with clothes you don't love. Once you have the wardrobe, spend a little time creating outfits and make sure you aren't missing the right color belt or a certain color undershirt. I like to plan out my outfits a few days in advance so I will do this Sunday night for the upcoming week. It makes me less stressed to have it done. Ladies, a work tote is a must-have. First, you need to carry all of your stuff to and from an internship. The old Vera Bradley tote from 9th grade is great for school and trips but do you really want to waltz into a professional legal internship carrying it? I am not huge on name brands so I do not have a Kate Spade or Michael Kors tote for work; I found a cute leather option on sale at Kohls that is high quality, exactly the size and style I wanted and did not break the bank. In my opinion, it's a win-win. Also, I spend a little time this week packing my work tote. Inside I have my wallet, my little cosmetics emergency kit, my planner, a small notebook for jotting down assignment notes, a small bag of my favorite pens because I am a pen snob, chapstick, hand lotion, a phone charger and a bobble refillable filtering water bottle because who knows what the courthouse water will taste like. For boys.... I guess this is a briefcase... Sorry I am of no use in what a male lawyer should carry. You have likely already done this when interviewing, etc. but it never hurts to brush up on things! Figure out where you are going to park, the route you will take to work, how early you need to arrive, etc. I emailed my internship supervisor early this week to work out last minute details. I drove down to check out the parking situation yesterday; I can pay for the parking garage on Monday. Check out the Linked In accounts of the lawyers you will be working under. See if there are any prominent cases happening and read up what you can. The more research and prep I have done helps me to feel less stressed on the day of. As I typed that, I internally said it in the voice of Tom Haverford from Parks and Recreation.... but I digress. You just finished finals and a whole year of law school. Give yourself a little break and do what makes you happy. For me, that was spending large amounts of time on my couch watching Netflix, working my way through a few new novels, doing a few face and hair masks, some shopping and cleaning my house top to bottom, cleaning out our closets, cooking, baking a million cookies and getting it back to an organized state. I am also planning on getting a manicure this weekend so I can walk in Monday morning feeling fresh, rested, happy and with bangin nails. I had things to do this week but I also spent it just recharging and refreshing after a few weeks of intense stress so I can move onto the next challenge. As hard as it is for me to believe that my first year of law school is over, I am enjoying my week off and I am so excited for my internship to begin! There will be many more updates throughout the summer so stop back to hear how it's going.